This is now at the top of my Toaplan collection, a game I love, one that I hoped to own and finally came into my hands, courtesy of gunbird18. It's Same! Same! Same! 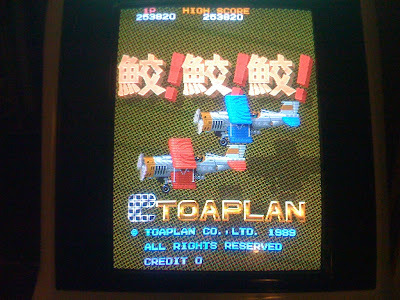 by Toaplan, the sequel to Sky Shark and one of Toaplan's greatest efforts. It's brutally hard and unbelievably fun, especially if you like your shmups hard. I found this PCB for gunbird18 a while back, spotting a Fire Shark machine on the St. Louis craigslist for $250. I had bargined with the seller for about four months, trying to get them to just sell me the pcb and junk the cab, to no avail. I needed to get the whole shebang or nothing. I finally let gunbird18 know about it and he went over and picked the whole thing up. I had borrowed the pcb a while back and converted it from the US version of Fire Shark to the rare 1-player Japanese rom version of Same! Same! Same!. And then after a few years of Todd owning it, he decided to sell it on and here it is. Awesome. 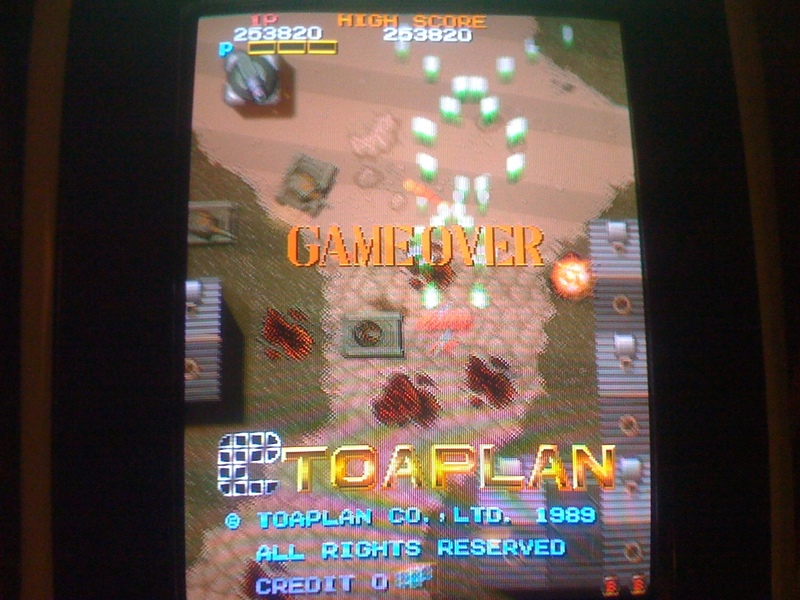 I just got an autofire pcb from rancor in Japan and played about ten credits last night and now I have to relearn the game with autofire. I got a few 300K+ games in and retired for the evening, smiling broadly. He definitely is! Great thing about this hobby is that it seems like it oozes great people. I have held a number of meets and get togethers at my place and not only has nothing ever gone missing, but nothing has ever been broken or mistreated, lost or spilled on.